Last month President Trump traveled to London to meet with Prime Minister Theresa May, and many Londoners opposed to the president's visit decided to greet him with a "Baby Trump" blimp. Now, another balloon is looking to fly high in the London sky, but this one isn't of the President of the United States. Yanny Bruere, a British "free speech advocate," has plans to fly a giant "Bikini Khan" balloon in Parliament Square to protest London Mayor Sadiq Khan. When asked why he is protesting the London mayor, Bruere told Townhall, "It's about free speech and seeing if Khan is willing to submit himself to the same mockery he did to our great ally's leader." "I doubt a giant blimp of Barack Obama would have been approved by Khan," he added. Bruere went on to say, "The fact Khan spoke on behalf of the U.K. (which he's not represented to do so) when he said Donald Trump isn't welcome to London also played a role in the decision." In light of the Donald Trump 'Baby Trump' balloon being allowed to fly over London during his visit to the U.K., let's get a 'baby Khan' one and see if FREE SPEECH applies to all and whether or not Mr. Khan and the London assembly will also approve this. Under Sadiq Khan, we have seen crime skyrocket to unprecedented levels. People in London don't feel safe and they aren't safe, 81 murders this year alone! Khan Out. Any surplus money raised will be used for a continuing campaign to remove Sadiq Khan from office and also for defending free speech which is constantly under attack. Of course, transparency of all money will be available. According to a tweet from Bruere, "Bikini Khan" cleared one hurdle on Thursday, as the National Air Traffic Service gave him and protesters permission to fly the blimp at a maximum height of 100 feet. Now all Bruere and his supporters need is approval from the mayor's office. As Erika reported last month, Mayor Khan appeared reluctant to let the "Baby Trump" blimp go up, arguing that the demonstration wasn't a "legitimate protest." But eventually, he relented and decided to let the balloon fly. When asked if he expects to get approval from Mayor Khan to fly his blimp, Bruere told Townhall that even though the mayor's office has changed the times of when the event can be held on more than one occasion, he does think he'll get permission. "I think he'll give approval, but as late as he possibly can so we have minimal time to organize," he stated. If Mayor Khan does deny their request, Bruere does have a backup plan. "We'll keep applying until he does approve it at Parliament Square," he explained. "But, we have had offers to take it on tour around the U.K. and will consider this too." Bruere has faced some opposition for his scheduled protest, telling Townhall that "liberal, white people" have called him "racist" and "Islamophobic." In another tweet, Bruere posted a screenshot of an email he received stating he could not fly the "Bikini Khan" balloon in Bingfield Park, a park that granted permission to Trump protesters to fly their blimp just a month ago. The EXACT same park that allowed Trump Baby balloon to have a trial run have DENIED the Khan balloon the same courtesy. Despite the opposition, Bruere did say there are people who are supportive of what he's doing. 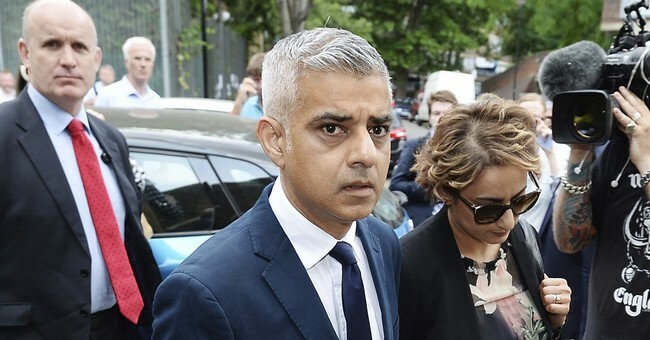 "Many, many people are unhappy with Khan given the current crime epidemic in London too," he explained. Unlike the United States, the United Kingdom doesn't have a First Amendment protecting a citizen's right to free speech, but Bruere expressed the importance of people having the right to speak out. "Our ancestors fought and died to protect our freedoms," he said. "In a nutshell, it's vital that this wasn't in vain and that we can talk about key issues that are changing our country without being shut down in various ways."